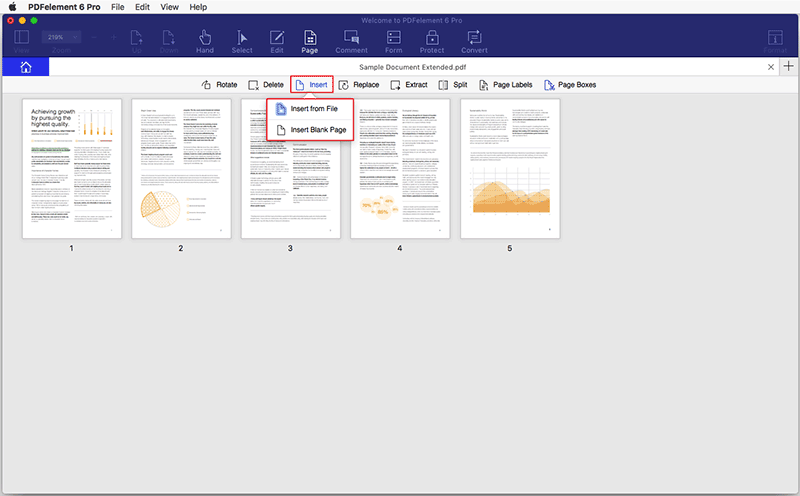 Do you want to effortlessly add pages to PDF on Mac? Here is how! With the help of PDFelement for Mac, you can easily insert pages to PDF on Mac. 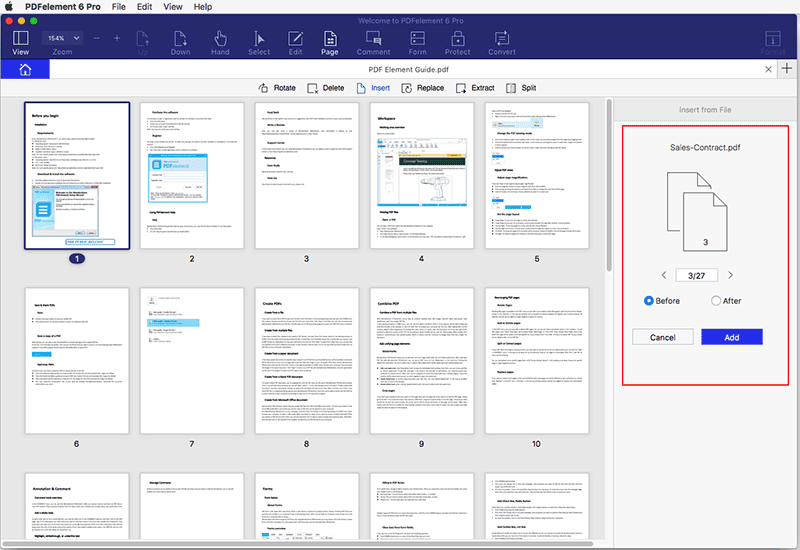 Whether you want to insert an existing page to a PDF file or add a blank page to PDF document, PDFelement for Mac helps you add pages to PDF on Mac comfortably! To add pages to PDF on Mac effectively, you need a reliable and easy to work with the program. PDFelement for Mac is the ultimate PDF solution. Wondershare has had an incredible history of creating exceedingly useful software, embedded with unique features that make it easy to perform specific tasks. Their products are highly efficient, and so is PDFelement for Mac. As the name suggests, is exceptional when it comes to performing tasks such as opening multiple PDF files, editing, and sharing. Open, edit, save, print and markup PDFs. 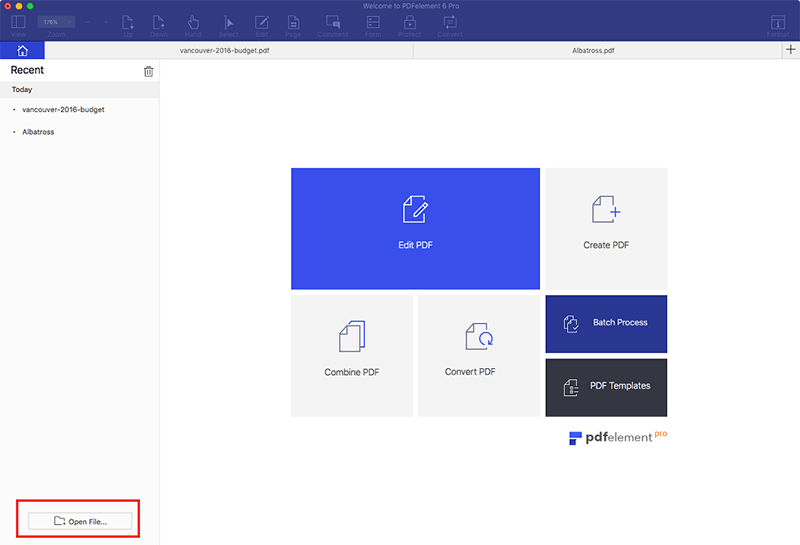 Add, remove, rotate, cut and resize PDF pages. Secure PDF documents with password protection. Convert PDF files into Word, Excel, PPT, HTML, Text and image etc. Create interactive form fields and fill out. To do this, launch the program by double-clicking the quick start button. Then click "Open File" button to open the PDF that you are going to add pages. Go to the "Page" menu and then click "Insert" button in the toolbar. Alternatively, you can click "Insert blank Page" when you want to insert a blank page. By default, the blank page will be added subsequently to the current page. You can then write on the blank PDF page if that was your intention. To select another PDF file, only browse. Go to the right side panel and choose the page that you intend to insert in the page number box. Next, click on the page thumbnail to choose the page in the current PDF file. Then choose the position you want to insert the file, either "Before" or "After" and add.To insert, click the blue "Add" button and the page will be entered automatically on the PDF file on Mac. In a world that is highly digitizing, we cannot overlook our encounter with PDFs. From students to professionals and job seekers, the PDF software plays a vital role in reading and sharing of documents. There is a wide range of PDF editors on the market, but very few can work to your convenience. In conclusion, apart from adding new pages to PDF files, you can also edit the documents. Visit the main menu, where all the options you need are available. You can split PDF into separate pages, change the layout and aspect ratio and remove unwanted pages among many other things. Visit Wondershare website and click on "Free Download" to get the installation package. After the download is complete, install the program on your Mac. With the successful installation and a few clicks stated below, you will be able to add pages on PDF documents on Mac.